Moving day can pack a ton of stress (no pun intended!) so it’s important to be prepared and ready when the day arrives. Below are some very useful tips to help you stay organized. Prepare for a good night’s sleep! up your bed for your first night in your new home. 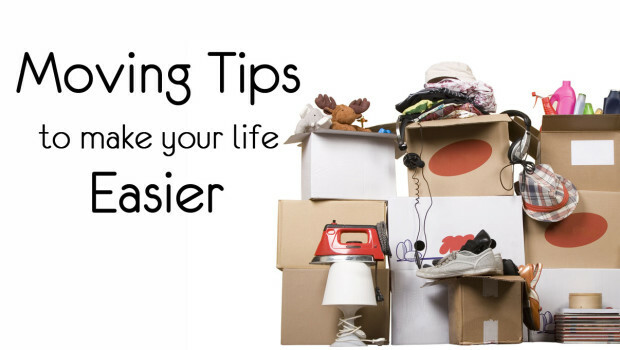 Pack heavy items in small boxes, and light items in large boxes. Tape down the lids of liquid medicines, glues, craft supplies, cosmetics, etc. Check with your mover in advance about what they will not transport; most movers will not transport paints, aerosols, ammunition, and many cleansers. Help your kids say good-bye. Buy a disposable camera, and take one trip around town to snap a photo of their school, favorite restaurant, your old house, friends, etc. Make sure they have the phone numbers, addresses, e-mail addresses, and birthdates of all their friends and classmates. Make a floor plan of your new home, and clearly mark where each piece of furniture goes in advance. Also, number the rooms, and put corresponding numbers on the boxes. Then, post a copy of the floor plan at the entrance to each room. Take a phone book from your old town with you to your new home. Plan to have a garage sale. As you’re packing, if you haven’t worn it or used it in the past year, designate it for the sale. Use the proceeds to decorate your new place, or to pay the kids to help you move. Keep essential or irreplaceable items with you in the car. Jewelry, small valuables, medications, birth certificates, photographs, etc. Fill prescriptions just before you leave, in case it takes a while to find a physician in your new town. Pack a box with items you anticipate needing early: toilet paper, paper towels, paper plates, coffee and coffee maker, telephone, baby food and diapers, soap, light bulbs, flashlight, batteries, pen and paper, tape, knife, screw driver, hammer and nails, and a surprise favorite toy for your child. Think about your pets. Consider having them stay at a neighbor’s while the van is being loaded. Be sure to pack pet food and leashes in the “unpack first” box. Carry your bill of lading with you, and assign someone to check off each item as it enters your new home. Be sure that you don’t pack any items that you will need for closing on your new home (check with your Realtor, mortgage officer or settlement agent), such as the HUD statement on the home you’re selling, copies of necessary powers of attorney, etc. Make arrangements in advance for funds for closing on your new home if you are changing banks. Carry a cell phone with you en route, and make sure that the moving van foreman has the number, and an alternative contact who can reach you.